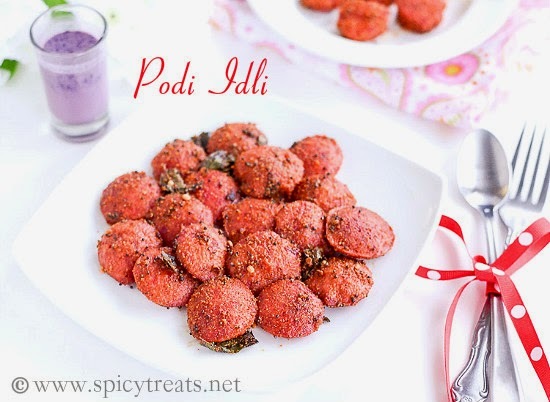 Podi Idli Recipe / Beetroot Idli recipe/ Roasted Beets Idli with step by step photos. 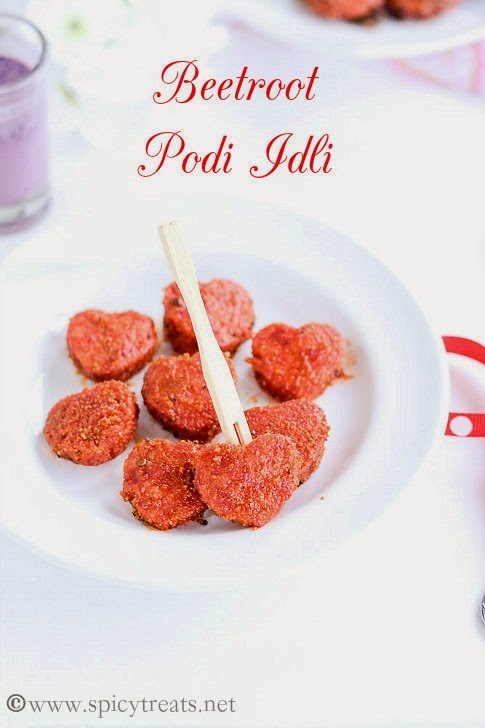 I wanted to share few Valentine Recipes with red or pink colored dishes. But at the same time I do not want to make any cakes or cookies or desserts. Because, I have already had so much of sweets/desserts in the name of blog during Diwali & Christmas. So I am staying away from sweets and no more sweets or desserts for sometime. In a cast iron pan or oven safe baking tray, add oil and sliced beetroot(make medium thick slices). Add some salt and pepper, toss gently and bake it in oven for 18-20 minutes. After 10 minutes toss beet slices and bake for 8 more minutes. Once done allow the roasted beets to cool for a while and grind it with 2-3 tbsp water to a smooth or little coarse puree. Now add the beets puree to idli batter, stir well and pour the batter into the greased idli plates. You can use mini idli plates or the regular ones. And steam cook the idlis for 10-12 minutes. After that allow the idli to cool completely before cutting with cutter. 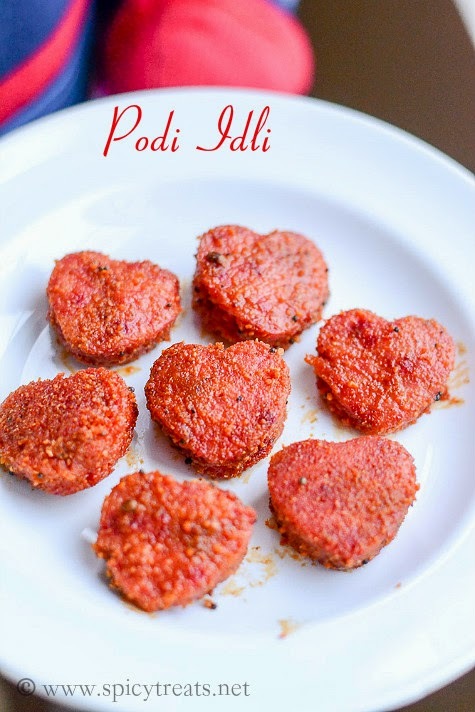 Once cool down, cut the idlis into desired shape and keep ready to make podi idlis. Heat oil in a pan, when it is hot add mustard seeds allow to pop, then add urad dal, curry leaves and hing, fry well. Then add idli powder stir it and add the idli pieces and toss well until all the idlis are coated with podi well. Add idli podi as needed. That's it..Once done serve Hot with ketchup or as such. 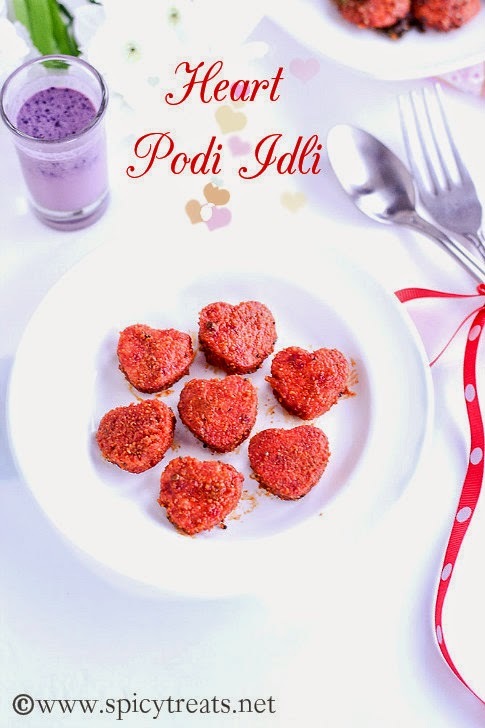 Instead of roasting beet root, you can simply make a fresh puree, mix it with idli batter and make idlis. But the roasting method gives unique taste. Beets idlis were midly sweet that are perfect for kids. Baking time varies based on your chopping method, i sliced medium thick so it took 15-18 minutes for me. You can also make Oothappam or dosa with this batter, I tried dosa too. 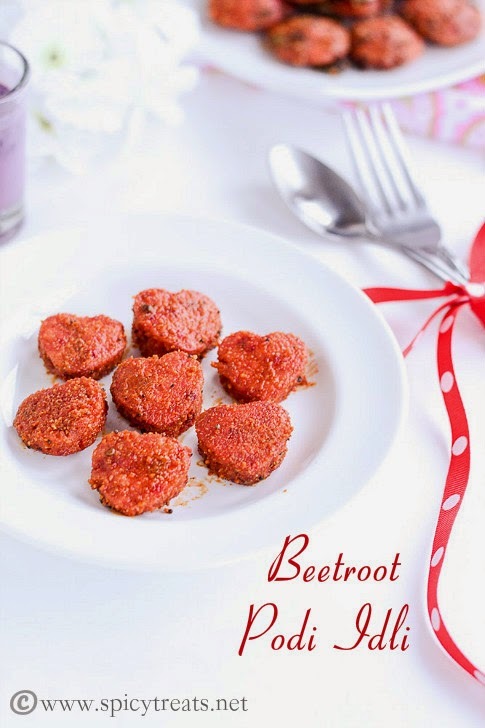 What an innovative and healthy recipe for the Valentines theme.. They look so cute and I'm sure would have tasted delicious..
what a wonderful idea,looks soo colourful !! such cute idlies :) too pretty clicks too. 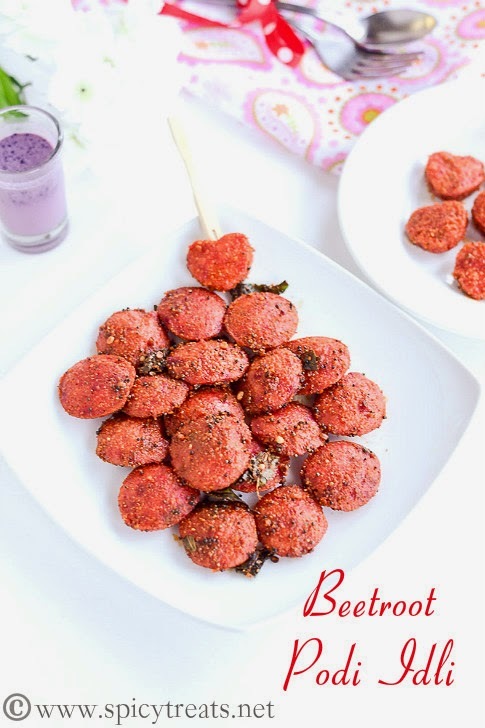 This beetroot posi idli looks fabulous!! A very innovative dish. Idlis look so cute, I just want to grab some...Very pretty presentation!! Nice idea Sangee, my mouth is watering here.. Awesome idea. And so healthy too.